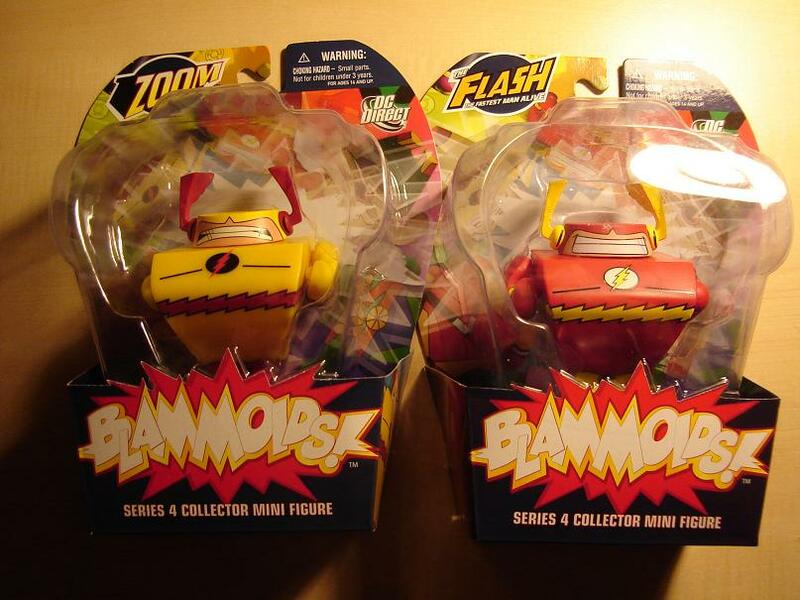 First up is the Flash and Zoom Blammoids. These guys are a very strange shape that is pretty polarizing; everyone I’ve talked to either likes them or hates them. 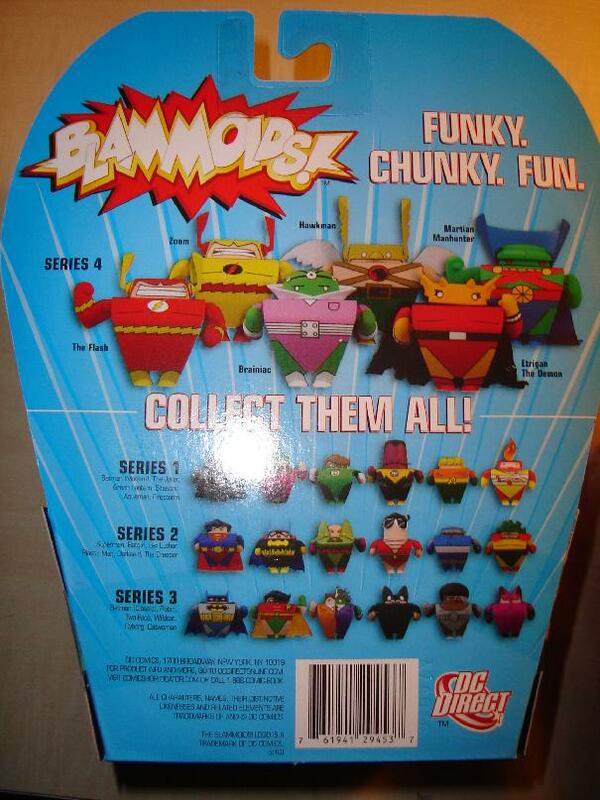 The packaging is real sharp; the blister pack is an enlarged version of the Blammoid’s profile. I really like the art on the sides. 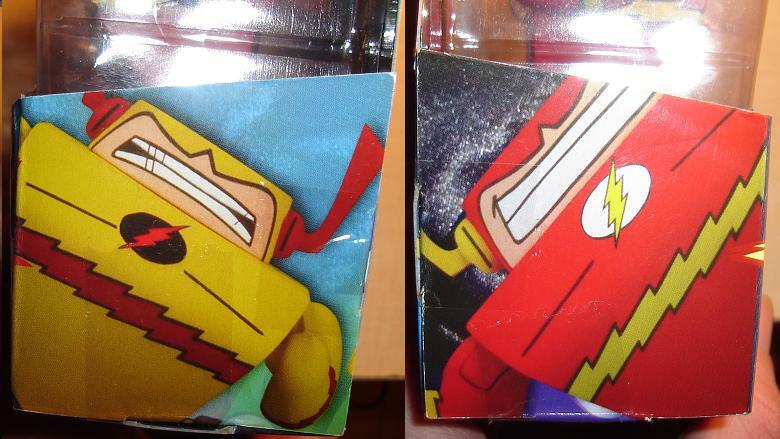 You can’t tell from the pictures but Flash and Zoom had the same side art with the hero on one side and the villain on the other. The back of the packaging shows all the figures for this wave (the fourth) and the three waves of figures that came before this one. Sorry about the glare from my camera’s flash, the figures it is blocking out are Batman and Joker. The Blammoids have three points of articulation. The heads turn and they stubby little arms are on ball joints. Looking at their tiny feet, they are quite stable. Mine have been sitting on my desk for the past few days and haven’t fallen over once. The thing that surprised me by these is how light they are. They feel very, very hollow. I’m not worried about punching my thumb through it or anything, but the material just feels thin. Flash and Zoom are identical figures, the only changes are done in the paint applications. Both characters have a solid stripe for the lightning belt and their lightning bolt facing the standard direction. For having almost no face I find them incredibly emotive. Barry has that giant cheesy grin while Zoom has that menacing scowl. Around 12 bucks a piece they aren’t horribly expensive. I do think they are a little over priced though. If they felt heavier/more solid I’d have had no problem with the price. With designs like this, you probably know if you want them or not with just one glance. So I'm not thrilled with the price, but I’m glad I picked up the set. Now onto the item that you’re more likely to see hanging on the pegs at your local stores, Action League! 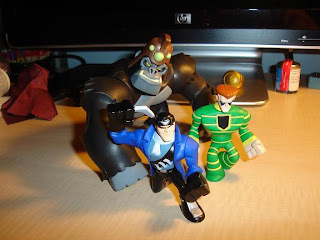 DC’s Action League is a continuation of the series that came out for the Batman: Brave and the Bold cartoon. 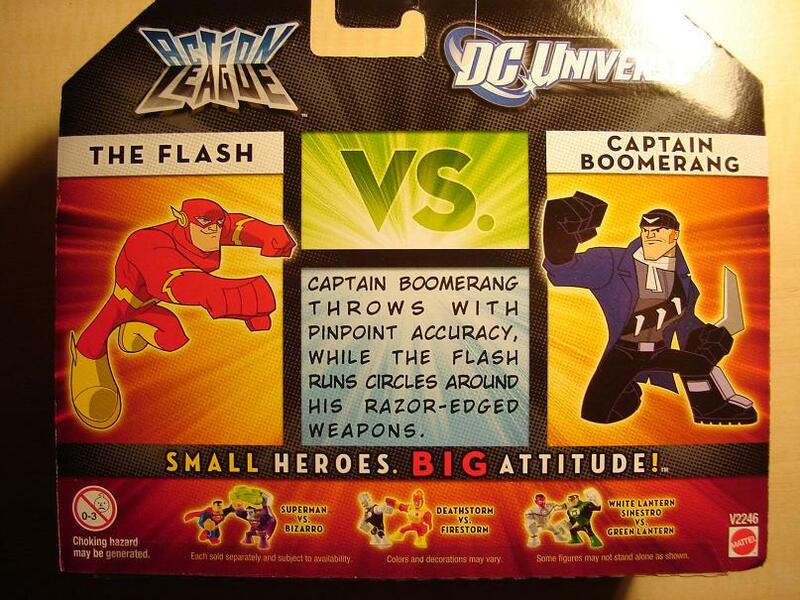 Now based on current events of the DC comics we get a Flash and a Captain Boomerang. There isn’t much to say about the actual packaging on these. The back does have little cartoon versions of the figures, a very brief bit about of information about them, and then at the bottom are pictures of the other figures in the wave. 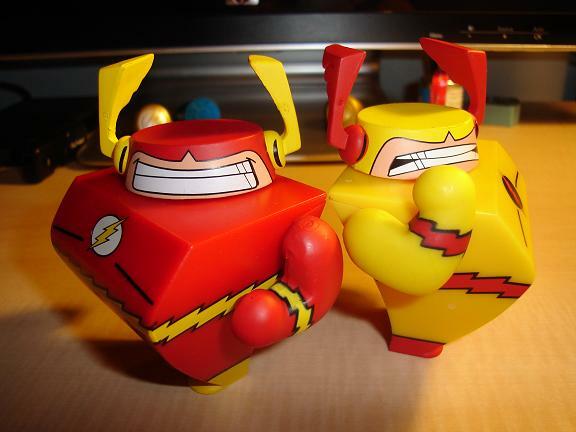 I do want to make one important statement when tearing these guys open, the Flash comes with a clear stand. It may be easy to loose that in all the clear plastic and you do not want to accidentally throw it away. Why is the stand so important? Because the Flash does not stand without it. Both figures have four points of articulation; swiveling at the neck, shoulders, and waist. You won’t get a ton of different poses out of them, but with a little experimentation you can do some pretty neat poses. Since they are tied into Brightest Day, these are the most current versions of the characters. Barry’s eyes are little blue dots and he has the straight lighting belt. They do have stylized proportions, so expect things like giant hands. 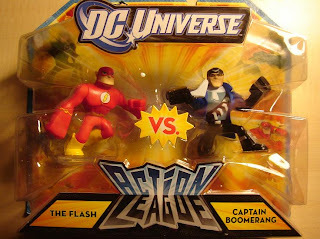 I actually think they work a little better then the Marvel Super Hero Squad, but that is obviously just my opinion. Boomerang is based on the resurrected Digger. 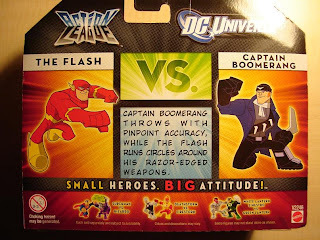 He has one boomerang ready to throw but like all of the toys in this line the weapon is sculpted into his hand and will never come out. Not that it is an issue. The little guy looks good. Combined with the Flash villains released in the Brave and the Bold waves we end up with a rather strange version of the Rogues. Yes, I realize Grodd isn’t a Rogue maybe he’s just mentally controlling Roscoe and Digger. I love this set. I can’t recommend it enough. 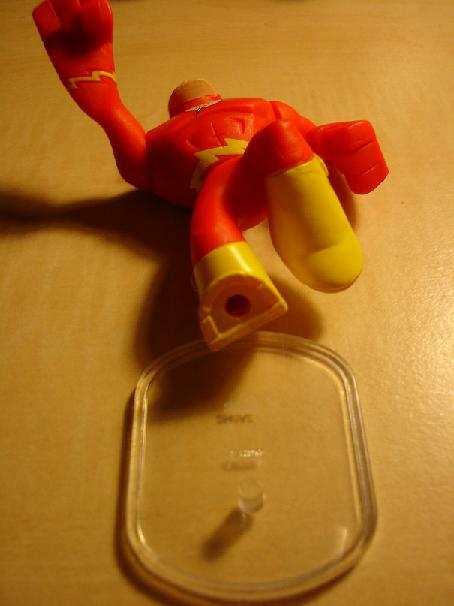 The Action League Flash does have an awkward pose, making him do anything but be in mid run is difficult. 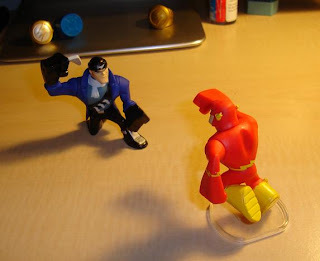 But I found that straight right arm makes for a wicked punch! 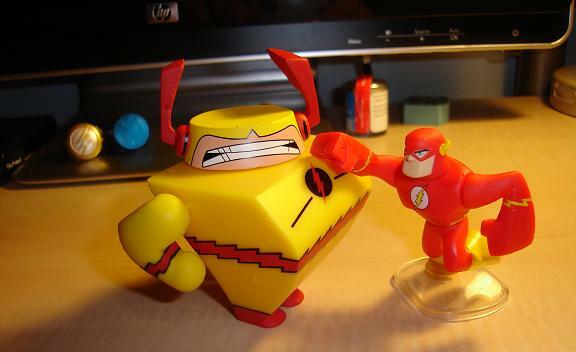 Every figure small enough for him to reach is about to take a Flash punch! 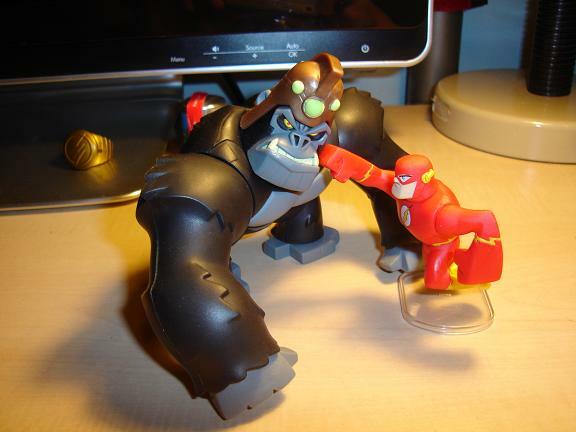 Take that Grodd! Anyway, hopefully you enjoyed the review/pictures. I’ll see you next week for more Friday Flashness. I however am firmly in the "don't like camp" for the blammoids. I do like the faces, but I hate the bodies (even more now that I have seen them from the side). Oooh! I didn't realize that the Action League Figures were available already! Gonna have to make like Ash and catch 'em all!